An artist’s impression of the Giant Deer and young, which the first people who came to Ireland (The Mesolithic People) ~ 7,000BC. Though huge the antlers were frail and for show rather than combat. 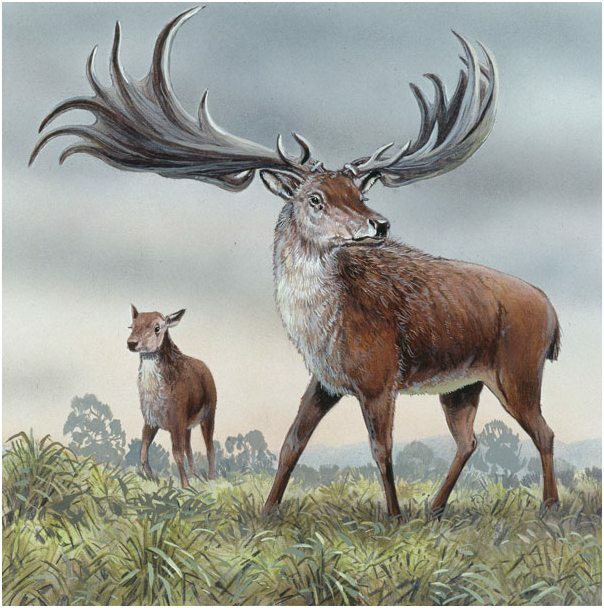 Giant Irish Deer is believed to have roamed the lowlands of central and eastern Ireland, weighing up to 800-1000 lbs. and stood at 2 metres at the shoulder, with antler width of up to 4 metres, (weighing up to 35kg) had the largest antlers known to have existed on any deer. There palm like antlers were similar to those of a fallow deer. They had very few enemies due to their size, with the wolf posing very little threat. Email me: Thanks for dropping by! Feel free to join the discussion by leaving comments, and stay updated by subscribing to the RSS feed.